Internal Heating Type Rotary Kiln | Product Information | KURIMOTO, LTD. This machine is a direct heating type of rotary kiln with rotary shell, which fires material through heat exchanging by contacting hot air (high temperature gas) generated by the burner provided at one end of the shell directly with the material. The shell internal wall is lined with firebricks for the shell protection subject to respective conditions. Furthermore, heat-resisting bricks are used for the lining as needed. The flow directions of the material and hot air (high temperature gas) are countercurrent, in general. According to the applications, however, concurrent flow may be introduced or a hot air generation unit may be provided in addition. It is also possible to mix solid fuel in the material or to provide a self-combustion process in the kiln. Furthermore, perfect air sealing is provided at both ends of the kiln shell, which makes it possible to keep the kiln internal atmosphere acid, neutral, or reducible in accordance with the applications. The bricks are determined according to the time-proven performance from every aspect such as temperature distribution in the kiln, wear resistance, and scientific properties (i.e., acidity, neutrality, and reducibility) of the material. As for the joints, dry joints are used normally, while mortar joints are used as needed. Generally, heavy oil or gas is used for the heat source, which enables either of mono-fuel combustion or multi-fuel combustion according to the combustion conditions. In either case, continuous automatic operation is facilitated through the temperature detection at a set position. The flame monitoring safety device is provided preparing for the contingency. 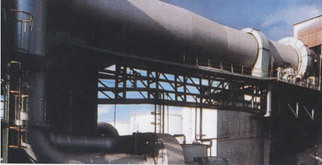 This rotary kiln is designed to keep the kiln internal atmosphere acid, neutral, or reducible according to the calcining conditions of the material. Normally, a pilot burner for main burner ignition use and brick drying burner are provided together. Before or apart from the kiln, a band dryer, rotary dryer, or heat exchanger is provided, enabling the effective use of the exhaust gas heat from the kiln. Usually, after the kiln, a rotary cooler or the like is provided not only to cooling high temperature material discharged from the kiln but also to introduce the high temperature gas heat-exchanged in the cooler as it is or recover the heat of part of the high temperature gas as the burner combustion air. In many cases the exhaust gas contains a considerable amount of dust, which is usually removed through a dust chamber, cyclone, bag filter, electric dust collector, or wet scrubber to discharge into the air through an exhaust fan. An exhaust gas re-combustion unit (used for deodorization or heat decompression of harmful gas), exhaust gas cooler (used for protection of dust collector or exhaust fan), or contaminant arrester (used for SOx, Cl2, or Nox) is provided as needed. In order to control the exhaust quantity and the kiln internal pressure, an exhaust fan damper is provided for the exhaust of gas through the exhaust fan, or a draft control damper is provided in the middle of the exhaust flue for the draft exhaust. The internal heating type of rotary kiln takes one of the most critical parts of the process requiring the high temperature treatment. The simple construction and functional handling provide a wide range of fields such as ceramic industry, non-ferrous industry, steel industry, and chemical industry as well as waste incineration.